All of the team here at Áiseanna Tacaíochta (ÁT) would like to extend a huge congratulations to our Director, Martin Naughton, who has been appointed an Adjunct Professor to the Centre for Disability Law and Policy (CDLP). CDLP, founded in 2008 and based in the National University of Ireland Galway (NUIG), is dedicated to producing research which informs debate on national and international disability law reform. Its work contributes to the progression of disability rights, the personalisation of disability supports, and the development of national disability strategies. Martin is one of three appointed Adjunct Professors to CDLP this summer, joining Catalina Devandas, the new United Nations (UN) Special Rapporteur on the Rights of Persons with Disabilities, and Gráinne McMorrow, a senior member of the Irish Bar and Ireland’s representative on the Council of Europe’s Venice Commission, which provides states with legal advice, in the form of “legal opinions”, on draft legislation or legislation already in force . Martin has been a leading disability activist for the past fifty years, and a pioneer of the Independent Living movement in Ireland and Europe. He has worked tirelessly to secure community living and flexible supports for the 600,000 people in Ireland and 1.3 million people in Europe who live with disabilities. 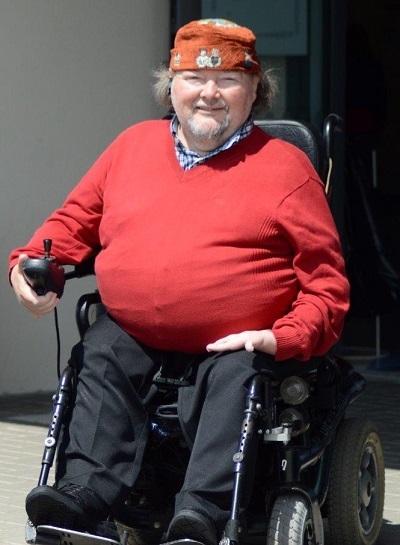 Martin campaigned and succeeded in co-founding the very first Centre for Independent Living (CIL) in Ireland, opened in Dublin in the early 1990s, inspired after his involvement with the CIL network in the United States (US) while travelling there in previous years. As a co-founder of our organisation in 2010, Martin also represents one of the very first people to promote Direct Payments and self-directed living supports for people with disabilities in Ireland. He works as a Support Officer with the Disability Federation of Ireland (DFI) and was a Co-Director of the European Network on Independent Living (ENIL) until January of this year. We’re very proud of Martin and all that he has done, and, on behalf of everyone in ÁT – from the staff and Board to our Leaders – we wish him the very best with his new role! Click here to find out more about the Centre for Disability Law and Policy. To find out more about Martin’s work and vision, please click here.